We have covered Taiwanese company IGS many times, they develop arcade games of varied styles and types that sometimes do end up out West. Last year at IAAPA they had some 3D games like Speed Driver 3 and Power Truck, the latter impressing many guests at the show. They had a game at IAAPA a few years back that I regretted missing out on, a submarine battle game called Ocean Force and they also were behind the English version of the new Crazy Climber, a game I also would love to try out one day. They have also developed some games not intended for the Western market as well, such as Oriental Legend 2. IGS is currently testing out a new party game in Japan called Funny Table (to my own amusement, my 6 yr. old son asked me what this was, I told him the name and he said “It doesn’t look funny”). It is a cocktail cabinet that uses a design similar to Kung Fu Ball by Subsino, offering head-to-head play on opposite sides of the table and a large 47″ widescreen monitor. The controls use something interesting – a combination of a button in the center of a knob/rotary controller that can be spun around. They are spaced out far enough that up to four players can play if desired. 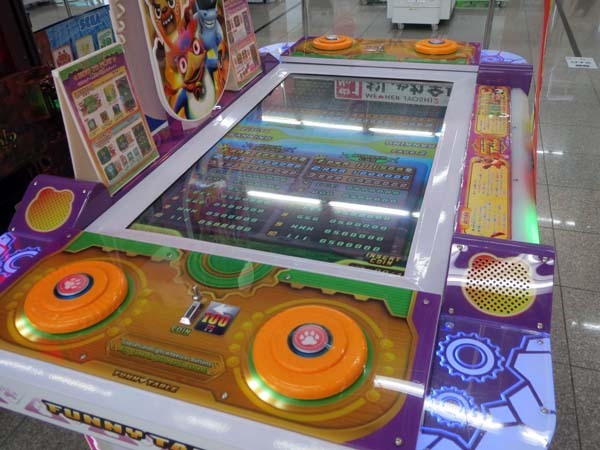 There are four mini-games (Pinball, Brick Breaker, Bumper Car and Castle War), a couple of those use both buttons and the wheel for control. Even though cocktail cabinets are not the most popular way to go in arcades anymore (Pac-Man Battle Royale being an exception), I think there is a good chance we could end up seeing this out West in limited quantities, through trade shows like IAAPA and some imports and I also base that partially upon the existence of an English mini-site that IGS has created to promote the game (where you can play the Bumper Car game with your mouse). Two Japanese websites have more information on the location test, Mieya’s Attic and Small Room of Aries. Here is a demo video of the game in action, showing at least two of the mini-games.